Sprint Cup Series drivers were overwhelmingly supportive of the new aerodynamic rules package that debuted in Saturday night's Quaker State 400 at Kentucky Speedway. In addition to the glowing comments, however, NASCAR had a significant amount of recent data from which to compare that backed up the positive comments. But what does the eye test say? It says this was singularly unimpressive. 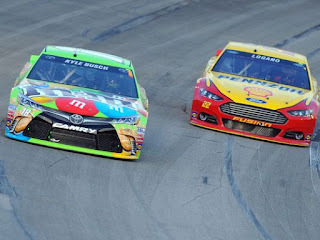 Yes there was passing, and in a couple of spots the battle for the lead got heated, but compared to past Kentucky races it wasn't that different, and it certainly does not compare to recent races like the Trucks at Charlotte that saw an epic fight for first in the final 25 laps. 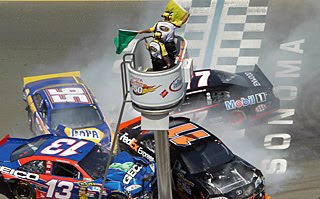 There is also the history of this low downforce package - it's the 5&5 Rule all over again and despite a memorable World 600 at Charlotte with that package it failed in 1998 and failed again when John Darby took over the NASCAR garage and stubbornly restored (this after some vicious and quite public Rusty Wallace lobbying of NASCAR) and kept it after the 2003 season through the COT, which was itself intended as a low-downforce design; the net result was spoiler reduction, multiple sway bar changes, and no improvement in passing. This package worked to some extent at Kentucky; history tells us it won't work down the road. Dog Breeds vs Human Races?